The new free app for iOS and Android-powered tablets provides an in-depth look into the careers and lives of Russian ice hockey players drafted by the NHL. The National Hockey League’s recent decision to cancel the upcoming season has sent ripples through the global world of sports, not least in Russia. The country’s own Kontinental Hockey League has benefited from such stars as Alexander Ovechkin returning to play in their native land. The gloomy fate of the NHL 2012-13 season prompted many of the league’s players to go overseas. Eventually, many players from Russia also decided to return home. The NHL’s archrival – the Kontinental Hockey League – has given its former players a warm welcome. Alex Ovechkin, Evgeni Malkin and Alexander Semin are once again making headlines, playing for Russian teams this time. Still, it was the NHL who first brought these stars worldwide recognition. Russia Beyond the Headlines (RBTH) nurtured the idea for a project dedicated to ice hockey players for a long time. The mission of RBTH is to popularize Russia-related topics around the world: famous players for North American hockey teams seemed to be a perfect point of interest for Western audiences. “We had no doubts about making our app completely free. Our goal was to get readers acquainted with Russian players – to get to know these guys better. We intended to dissolve the myth of the so-called ‘Russian factor.’ In the end, this will help our readers to understand Russia itself better. This is an idea which cannot be measured by money,” said Kirill Rudenko, RBTH Mobile Editions editor. The Russian Hockey Players Guide contains thoroughly designed profiles for the most interesting players on the ice. Moreover, all of the NHL newcomers from Russia who were drafted this year are included. The guide is not merely a handbook of game statistics. It also tells the story of each player, providing readers with players’ backgrounds, thoughts and personalities. There are plenty of magazine-quality photographs and a lot of eye-catching videos, as well. In addition, users can vote for their favorite player and help to create an RBTH-backed rating of Russian hockey players. The guide even includes interactive games that, for example, allow users to match their physical attributes to those of their favorite players. 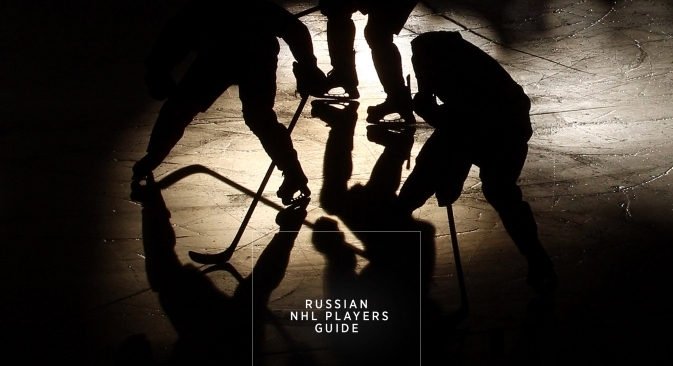 The Russian Hockey Players Guide is available on the two most popular platforms: iPads and Android-powered tablets. Users with the iPad 3 will be able to enjoy Retina-quality photos and other graphical materials, while others will welcome smaller and easier-to-download versions of the app. It should be noted that the app requires an Internet connection to play videos. The Russian Hockey Players Guide will constantly be updated, as user feedback provides ideas for further improvement. RBTH invites everyone to download the new app and share their opinions at ipad@rbth.ru. Last – though not least – give other apps by RBTH a try: the Voices of Read Russia and the flagship RBTH for iPad.